As Hurricane Isaac slammed into the Gulf Coast causing evacuations, flooding, property damage, fear, and all the terrible things a hurricane can bring with it, something kind of awesome happened, too. On a thin little stretch of Alabama beach that reaches between Gulf Shores and Fort Morgan on the east side of Mobile Bay, Isaac’s fury revealed a shipwreck, about 136 feet long and previously burned, from days gone by. If you’re unfamiliar with the location, glance at a map of Alabama, concentrating on that little southern piece that meets the Gulf of Mexico. And then look more closely because you probably missed it the first time. It’s not much more than a single main road lined by bits of the Bon Secour National Wildlife Refuge and beach front vacation homes. Every couple of years for as long as I can remember a portion of my family vacations there. It’s always the laid back family reunion sort of vacation where folks may come and go as they can and you’re always sure to see some cousins, aunts, uncles, and friends you haven’t seen for a while along with a few new faces, too. There’s never much of an agenda beyond a little beach wiffle ball (in the water is probably a homerun; if you cause someone to plunge into the surf chasing your ball, you’re a hero) and inside someone is always cooking something wonderful. And at the risk of sounding like a court mandated BP commercial, it’s really beautiful. 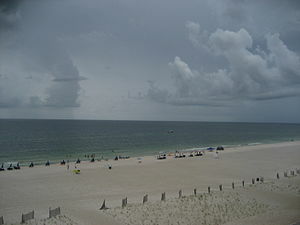 If you’re a beach vacation kind of a person, it’s worth giving a try. I don’t always make it for the big family gathering, but I have been there several times over the years and I have managed to take both of my sons as well. Sometime in the coming years, I’m sure we’ll return because we love it. I can only imagine what was going through his head: images of sharks chasing frightened little fish through portholes, peg-legged pirates running wildly to save their damaged ship, a prince floating adrift in the open sea awaiting rescue by a pretty singing mermaid. And why not? Don’t we all love a good historical mystery? But even though this was the first time I’d ever heard of the ship, it’s not the first time it has ever been seen. Hurricanes in 1969, 1979, and even 2004 all revealed parts of the wreck in the sand, but Isaac has shown us more of it than has been seen in a long time. In 2004, when Hurricane Ivan uncovered a smaller portion, there was enough of the wreck visible to get historians really going, trying to figure out just what ship they were looking at. 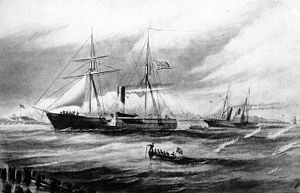 The 136 foot Monticello was a Confederate blockade runner that failed to outrun a Union navy gunboat and burned to the keel. At close to 150 feet, the schooner Rachel was run aground with a load of lumber (and rumor has it, illegal booze) in 1923 by a tropical storm. The ship was later burned, for unclear reasons, though local legend chalks it up to insurance fraud. A captured rum runner, Aurora, carrying around 1400 cases of liquor (toward the end of prohibition) was being towed toward Mobile by the US Coast Guard when it caught fire and sank somewhere near Fort Morgan. Though these wrecks each bear some resemblance to the mystery boat, there are a few clues that have pointed historians to their final conclusion. First, the wreckage contains woven steel cables, not used in shipbuilding during the Civil War era. The beam construction of the ship, too, points to a design that was more useful for stability than for speed, so it’s not likely that this was the blockade runner Monticello or any of the other many sunken Confederate Blockade runners that might have been contenders for consideration. There’s also some evidence that suggests that the wrecked ship was a steam-powered vessel, and though little is known about the Aurora, its 8 crew members were safely aboard the Coast Guard vessel when it burned and 8 seems to historians a pretty small crew to be operating a steam vessel of that size. This leaves us then with the Rachel (not just a popular 90’s hairstyle). I confess I am a little disappointed. Historians have pretty much all agreed that this was just a working lumber ship that fell under some trouble. Thankfully, her crew made it to safety. But they never were very forthcoming about her cargo so if she was smuggling booze, well, we’ll never know for sure. And whether she was burned intentionally in order to cash in on insurance we can only guess. So maybe there is still a little mystery. And who knows? Maybe the crew was rescued by a singing mermaid. They never said they weren’t. Very cool – it would be neat to see that! Yes, I wish I could be there to see it in person. Sounds like it will be intentionally covered over again to protect vacationers from potential injury, but it is located on private land and moving it is cost prohibitive so maybe there will be more chances down the road. I love that kind of thing…even if it’s disappointingly “modern”! It’s so cool to see the remains of a past era emerge from (literally) the sands of time. Agreed. I think it’s especially cool to see historians at work fitting the pieces of history together until they match up right. Of course I probably like to write fiction because that way I can make the story as exciting as I want it to be. I wish it was the Civil War ship – what a romantic tale that would have been! I guess the blockade runner is still out there somewhere. If only I knew how to scuba dive!